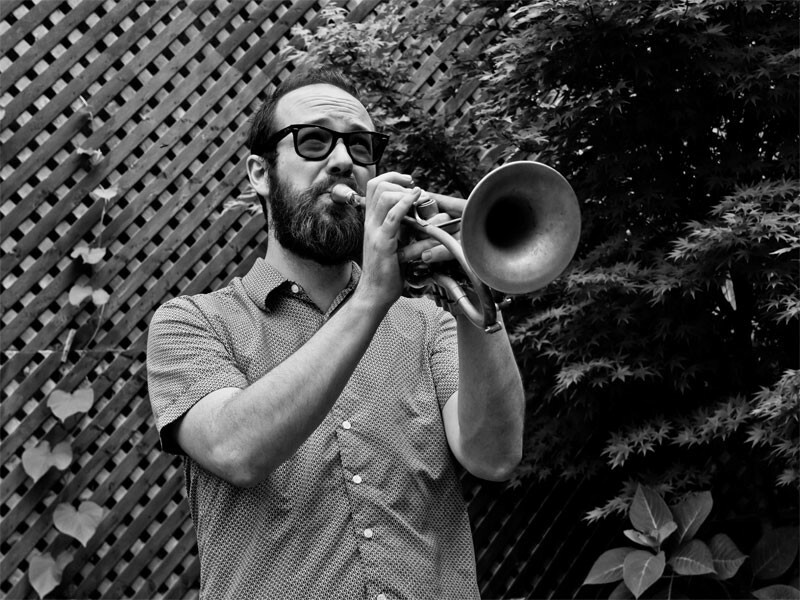 Originally from Colorado, cornetist Kirk Knuffke has been based in New York City since 2005. In a genre of music increasingly taught in higher education, Knuffke is distinguished by being a largely self-taught musician, though he has studied for short periods of time with improvising legends such as Ornette Coleman, Art Lande and Ron Miles. He leads several of his own groups, including the Kirk Knuffke Trio (with bassist Lisle Ellis and drummer Kenny Wollesen) and Quartet (with trombonist Brian Drye, bassist Reuben Radding, and drummer Jeff Davis. He also led a sextet with the late Butch Morris conducting that included Christof Knoche (bass clarinet), Tony Barba (clarinet), Eivind Opsvik and Reuben Radding (bass), and Michael Attias (alto sax). Additionally, Knuffke has fostered a number of collaborative enterprises in duo formats with pianist Jesse Stacken, drummer Mike Pride, and Drye. Knuffke has also been very active as a sideman in the Matt Wilson Quartet and in the bands of Andrew D’angelo, Josh Roseman, Jeff Davis, Ideal Bread, Mark Helias, Kenny Wollesen, and Bill Goodwin. In 2011, Knuffke joined Matt Wilson and Mary Halvorson in the collaborative trio, Sifter.